The known world consists of dozens of continents floating in an airy void. These continents range from small islands a few square kilometers in size, to great land masses up to 1,000 square kilometers and more. In these regions, there is a human society, strongly divided into castes. The proprietors, sorcerers, and merchants all live together in each continent, but rarely intermingle. Mining is a strictly a job for the merchants; the other classes wouldn't touch it. Most of the surface land on each continent belongs to the proprietor's class, so the merchants have limited options for mining. But the underside of these continents is unclaimed. A detailed in popular imagination, the underside is simply and exposed rocky surface, with all sorts of minerals visible to those who care to look. How can the merchants mine and transport minerals available on the underside of the floating continents? The continents float by an unknown mechanism. Gravity otherwise works as expected; if you fall off you don't come back. The continents are roughly hemi-spherical. A continent 10 km wide would be 5 km deep. The continents all float at the same 'level.' Ships can float at the same level as well to trade between continents, but they can't go down to the underside of the continents. There exists magic, but it is the province of the sorcerer caste, and is not available to the merchants. There are various flying beasts, drakes in particular, that could be of use, but they belong to the proprietor's class, and are similarly not available. Most surface land belongs to the proprietors, so the goal is to start mining from the sides or bottom. There is no chance the sorcerers or proprietors would assist in a business venture with the merchants. Your merchants have access to ships, and probably more so than the other castes. The ships themselves may not be able to go under the floating level, but as the continents themselves show, they should be able to carry quite a load suspended underneath. A mining operation starts with one ship floating near the edge. It lowers the mining bell, a large cage with enough room for several miners, holding tanks for ore and equipment racks. The mining bell has one side with sliding doors, wheels (aligned vertically) and a ballista loaded with harpoons. The sliding doors are opened, proper hooks are secured in the rock and the digging commences. When the easy to reach deposits are gone, hooks are secured lower and the bell rolls down the rock face using its wheels, always anchored to several hooks. Should the fastening fail, the mining bell will still hang from the ship's chain. If you want operations to be more advanced, the next logical step would be to construct a base station (actually top station) at a level reachable from the ships, before the curvature of the continent becomes too pronounced. This station would be inside the rock with a large wooden receiving platform where crews and supplies are lowered and ore plus offduty crew sent back up. From there, vertical elevator rails will be built down along the rock face, because digging in and then down is too expensive and boring. When the overhang becomes too much for the rails to carry loaded carts without tearing free, the digging goes inwards or branches off to the sides. 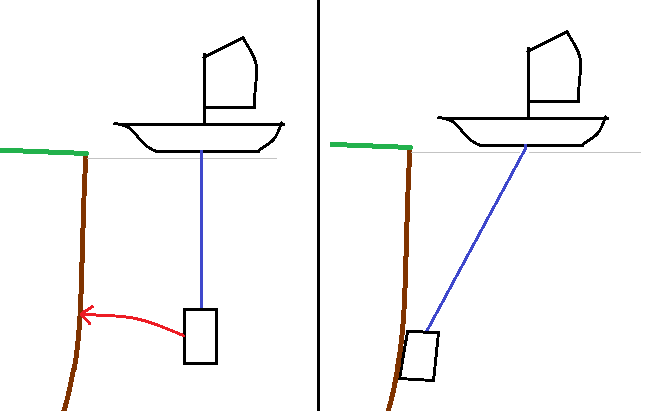 If the floating force is much stronger than gravity, an alternate option is for mining to start with the bells as above, but then the crew anchors a second chain directly to a large block, gets to a safe distance and detonates explosives around the block. Hopefully, the block will swing free and can then be hoisted up to floating level, at which point miners can more safely extract the ores. Physically hold your miners over the side. 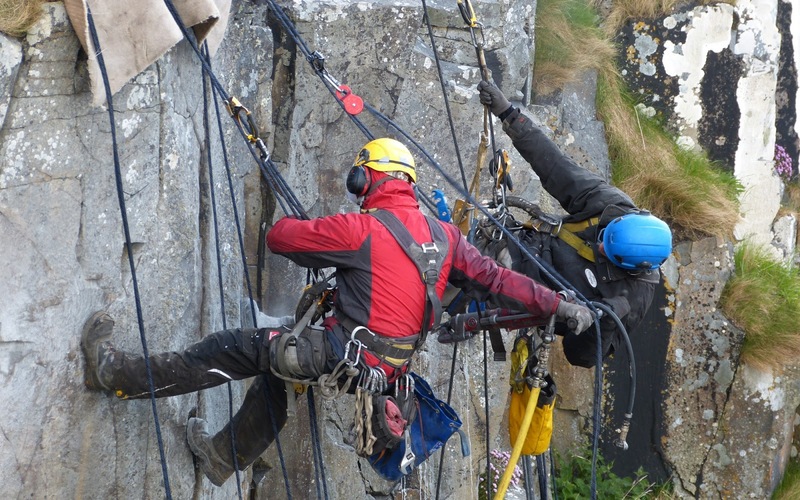 Send them down on ropes, or set up scaffolds and other works that anchor into the rockface beside/above them. This would be a complex undertaking, but compared to construction scaffolding, or the elaborate works that were used for mining in the real world, they're not out of scope with what you can do with basic tools and a lot of motivation. It should go without saying that this will be dangerous work. The slightest mistake and you could be swept from the scaffold to certain doom, or a whole platform could collapse and kill entire work crews. Again, though, mining was (and is!) a dangerous proposition in the real world, and yet it got done. Largely this was through slaves, or whoever was at the bottom of the local labor market - people who had few if any safer alternatives to pursue. The other problem is how you get the spoils. You'll need to arrange your platforms rather cleverly to make sure that what you're mining doesn't just fall off the continent, and that you can drag it back topside when you're done. On the other hand, you can simply drop your overburden (underburden?) into the abyss after tunneling, something I'm sure real miners would love to be able to do. How can the merchants mine and transport minerals available on the underside of the floating continents? have miners harvest minerals from underside using said network of anchor points and carry them on the upperside using the available tunnels and facilities. NOTE: secure miners with rope before reaching the underside. 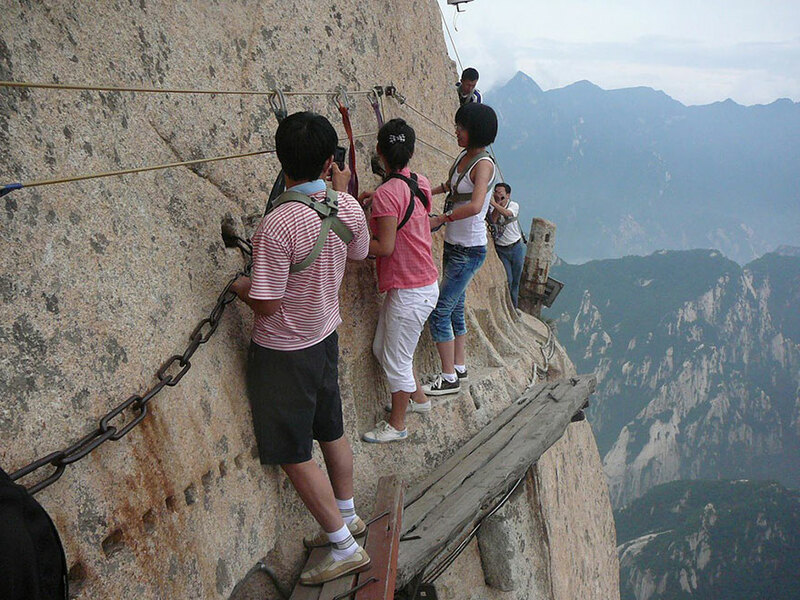 Else they will fall down as soon as the passage is open. If the proprietors are so insensible to the scent of money to not allow digging tunnels from their land, you can reach the borders of the continent and from there secure wooden/metallic frames descending along the side. At any convenient level you can then start digging inwards. As bonus point, you don't have to worry about carrying valueless material up: just throw it down. Ok so I would say use submarines. If you have ships that float and humans that fall there must be some point at which ships sinks. If you load enough humans on a ship it will go down. Now lets replace humans with sand (no particular reason but it's slightly more humane when you want to go back up...) And get ship to sink slowly. There are to options what will happen then. First one ship stops sinking after it reaches some depth. Second it will just sink indefinitely. while first one is better for us we can live with second one easily. What you now need is some way to power the ships. I think merchants should be pretty good at this but if they have any problems just use some sort of railing system (the boats are almost weightless so that should be easy enough). You will need some sort of platform for your miners and it has to be on top that should be ok se long as railing system support these big mining ships. and you can use light fast ships to create attachments for "rails". You have to balance the weight of the ship as you mine but that seems like part of the fun. If you drop too much contraweight your miners are 2D now if too little they end up in abyss. Think something similar to rock climbing, but in reverse. You hang tools, netting, and drilling items over the side connected to ropes and cables, and from there use a series of hanging excavation buckets to raise it up to the top, where it can be refined further into useful metals. Depending on the type of mining (marble mining for example is in large chunks or slabs usually, whereas the process is different for materials like coal or precious metals or salt, etc. 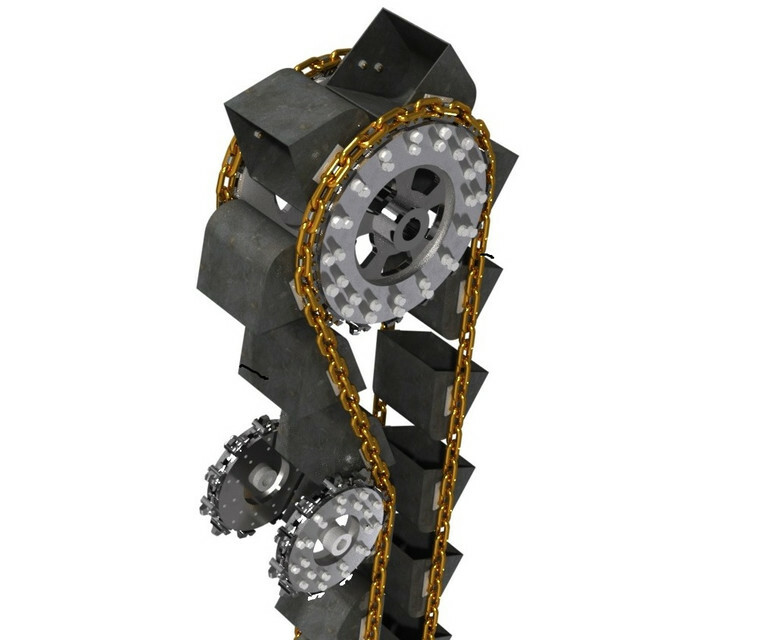 ), the lifting process might be a bit different but the mining process itself should be the same. Have something like four or six ships connected by a veeeeery big net/network of flexible bridges. They go around the island with the net very low under the island and then pull it up so that it goes against the cliffs. Have people work on these nets/platforms and when the work is done, just lower it again and go away. You may still need to have people to climb the cliff with ropes and scaffoldings, but at list you won't have trouble getting the ore back. Keep in mind that one of the main issues with mining in pre-modern times was getting rid of the water - that's what limited the depth you could reasonably mine into. If you can't drain the water, mines will quickly flood and prevent further mining. In your scenario, this limit wouldn't exist - you could relatively easily keep drainage tunnels to the sides of the floating islands, allowing you to dig pretty much wherever you want, as long as you started on the sides or the bottom. the question fails to address hydro static equilibrium. the density of the air beneath the continent must be greater than the continent itself, it were to float using buoyancy force... which it doesnt... the problem with ignoring hydro static equilibrium is present in allowing ships to sail from one continent to another (which implies a sharp density gradient). therein are two things implying hydro static equilibrium. any answer will have to address the immense pressure that would be present beneath the continent. (gravity otherwise works as it should). any miner would need pressure protection and significant 'dive' weights, as each miner would be very buoyant. In addition to all the practical suggestions about the mechanics of mining, you might like to consider the socioeconomic aspects. How did your landowners get to be landowners? Probably by having a bigger army than their predecessor. If so then as soon as mining becomes profitable some landowner is going to go to the miners and make them an offer they can't refuse. Not the answer you're looking for? Browse other questions tagged magic engineering mining or ask your own question. 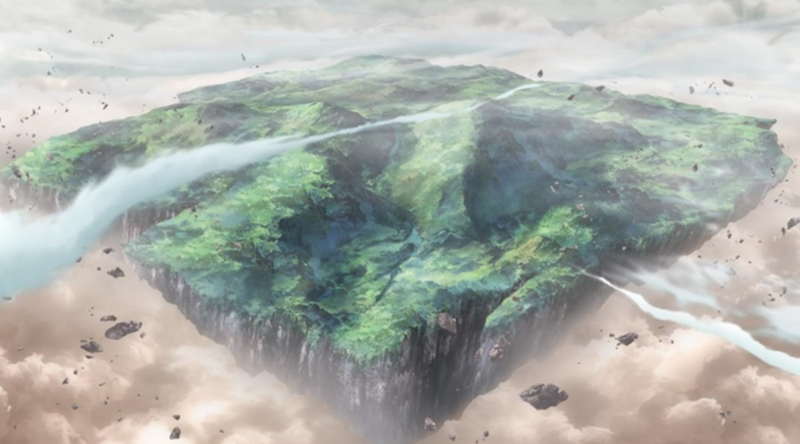 How would floating islands work?